Guest Services | Concierge Services | Snowmass Vacation Condos Aspen and Snowmass Rentals, Luxury Homes and Condos and Mighty Mouse Management offer a variety of luxury rentals within Aspen and Snowmass Village. You can book your desired property directly online, view pictures, get rates, find specials, and get more info on activities and events. We will help you plan the perfect Colorado vacation. Choose from a variety of luxury vacation homes and vacation condos. Whether you are looking for ski in ski out or shuttle bus access, our rental experts can help you find what you are looking for. We have been managing and renting properties for over 22 years. Our staff is knowledgeable of the Aspen and Snowmass area and can help you find exactly what you are looking for. For years we have been providing families with summer fun and skiing enthusiasts with the Snowmass experience, with great ski vacations, condo rentals, accommodations, Colorado vacation home rentals and personalized trip planning to Snowmass Village. Let us show you how to make the most of your trip here. From the slopes of Snowmass Mountain to the famous shopping and nightlife of Aspen, to a dog sled ride in the beautiful snow packed trails. We can help make your winter or summer visit the absolute best it can be. 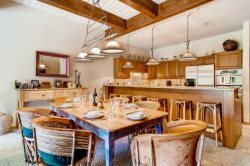 We have a variety of luxury vacation rentals in the Snowmass Village area. Where else can you find awesome views with snow as fresh and as deep as you could ask for? Whether you prefer skiing or snowboarding, cross country skiing or just a walk in the beautiful outdoors, our friendly and helpful staff are here to make your Snowmass experience come true. Call or e-mail us today. Tell us what youre looking for, when youre planning to stay and what you really want from your trip here. You will want to come back again in the summer once you've experiences our fantastic winter. The summers here are beautiful and possible our best kept secret! When the snow melts and the leaves come out Snowmass Village offers many hikes around the village as well as planning for rafting, biking, climbing and much more! Then, the fall colors are unforgettable. Take a look at some of our great condominiums and home rentals and give us a call so we can help you plan your Snowmass vacation that is best suited to your specific needs.